Dr. David Fitzpatrick is Chief Executive Officer, Scientific Director, and Research Group Leader at the Max Planck Florida Institute for Neuroscience. David received his B.S. degree in Biology from Pennsylvania State University and his PhD in Psychology and Neuroscience from Duke University. He conducted postdoctoral research at the Medical University of South Carolina and then returned to Duke University as a member of the faculty. 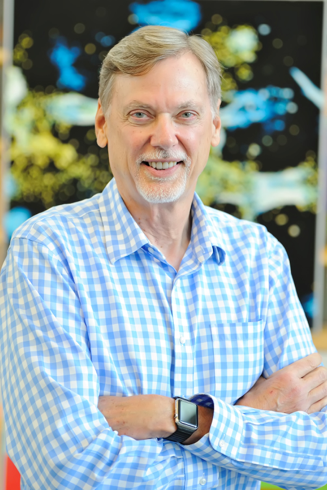 Before accepting his current positions at the Max Planck Florida Institute, David was the James B. Duke Professor of Neurobiology and Director of the Institute for Brain Sciences at Duke University. David has received numerous awards and honors over the course of his career for his outstanding research and teaching, including the 2011 Ellis Island Medal of Honor from the National Ethnic Coalition of Organizations, the Alfred P. Sloan Research Award, the Cajal Club Cortical Discoverer Award, the McKnight Neuroscience Investigator Award, and the Excellence in Basic Science Teaching Award from Duke University School of Medicine. David joined us for an interview to share his experiences in life and science. When David isn’t hard at work at Max Planck, he spends his time hiking, biking, kayaking, and immersing himself in nature. He has also become a keen photographer, capturing captivating photos of the natural world and memorable moments in his life. The brain is important for so many aspects of our daily experiences, including what we perceive, what we think about, how we move, the decisions we make, and more. However, we still know relatively little about how the brain works and how it develops. David’s goal is to dive deep into these basic science questions of how the brain works and how it develops. When David went to college, he was considering becoming a veterinarian. After working in a veterinary hospital during the summer, the routine nature of the work started to make him wonder if he should pursue a different career altogether. David was fortunate to take two neuroscience courses taught by a remarkable teacher at his school. In these courses, the teacher really brought the material to life, and it was this engaging way of presenting the science that made David want to study the brain. Doing a lab rotation and getting hands-on research experience sealed the deal. In David’s lab, they are doing cutting-edge imaging on the dendritic spines of neurons. These dendritic spines are where the input signals to a neuron arrive. To image dendritic spines, they wanted to use two-photon imaging in live cells so they could use fluorescent calcium sensors to visualize changes in calcium. These changes in calcium signaling are highly correlated with changes in the activity of neurons. Initially, they had to work through a lot of challenges with the methods for this research. The laser intensity of the two-photon microscope was harming the cells they were trying to study, so they had to change the kind of microscope they used. In addition, there were a lot of different issues with the molecular reagents they needed to use to look at the calcium signaling in neurons. With great effort and ingenuity, the group was able to work through these challenges. However, when you read a scientific paper, these efforts and long days of problem-solving often go unappreciated. Some of David’s most meaningful successes are having students and postdocs who work in his lab go on to do great things. For example, one of his graduate students recently defended his thesis, and this was a really special occasion. This student took a risk by coming to the Max Planck Florida Institute in the very beginning when the labs were just getting set up. When he started, the student had never done research techniques like viral injections and two-photon imaging, but he became an accomplished scientist using these methods. Multiple labs were interested in recruiting him to work there as a postdoc, and he chose an excellent lab at Harvard University. In addition, the student is having an impact on the field and building a network of people who want to be part of the work he is doing. Seeing students like this reassures David that there will be another generation to carry the flag of fundamental basic science when he retires. David has traveled to many places in South America, including Brazil, Argentina, and Chile. The Max Planck Society partners with some of the universities and institutes there, and as part of this initiative David helps recruits scientists and provides scientific mentorship. Most recently, David traveled to Rio de Janeiro in Brazil. The environment was wonderful, there were many beautiful natural attractions, the city of Rio de Janeiro was amazing, and it was exciting to meet so many young people who were driven, creative, and deeply interested in science. After his presentation, there was a long line of people wanting to ask him questions about his work. The economy there is difficult for scientists, so David encourages aspiring scientists to keep an open mind and explore international training opportunities at Max Planck and other institutions. David and his lab will be featured in an upcoming documentary about the development of the brain. The videographers came through the lab, spoke with David, and then stayed around a while longer to film different things in the lab. He recently received a draft of the movie, and he was surprised to see that the pyramidal cell tattoo of one of his postdocs made it in the final version. David had no idea that this was filmed when the team was onsite, but he liked how it captured the passion of the people doing research in his group. Follow your nose because so much of science is serendipity. Finding the most interesting questions to answer in neuroscience can be challenging because we know so little about the brain, but if you are curious and vigilant in looking for the unexpected, you may stumble upon new discoveries and opportunities for innovation. Dr. Fitzpatrick’s scientific contributions have earned him international recognition as a leader in systems neuroscience, with a focus on the functional organization and development of neural circuits in the cerebral cortex–the largest and most complex area of the brain, whose functions include sensory perception, motor control, and cognition. His current research utilizes state-of-the-art in vivo imaging techniques to probe the cellular and synaptic architecture of circuits in primary visual cortex, with a particular focus on the role that experience plays in the maturation of these circuits. He is the author over 80 scholarly papers including articles in journals such as Nature, Nature Neuroscience, Neuron, Science and the Journal of Neuroscience, and he has received a number of awards for his research accomplishments including The McKnight Neuroscience Investigator Award, an Alfred P. Sloan Research Award, and The Cajal Club Cortical Discoverer Award. In addition, Dr. Fitzpatrick was awarded the Ellis Island Medal of Honor in 2011. He has served on numerous scientific advisory boards including the Wellcome Trust, the National Institutes of Health, the Searle Scholars Program, the Riken Brain Science Institute, and the Society for Neuroscience. He has served as an editor for a number of scientific journals, including Senior Editor for the Journal of Neuroscience. Outside of work, David enjoys hiking, biking, kayaking and capturing the wonders of nature with his camera.